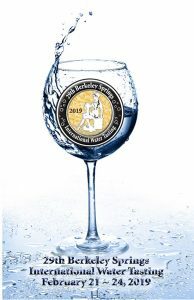 Berkeley Springs International Water Tasting – The world renowned international water tasting award. The world renowned international water tasting award. The award-winning 29th annual Berkeley Springs International Water Tasting welcomes more than one hundred waters from across the country and around the globe on Saturday, February 23. Held in the historic spa town of Berkeley Springs, West Virginia, it is the largest water tasting competition in the world. In 2017 Nancy Andrews 100 Days in Appalachia includes a visit to the Berkeley Springs International Water Tasting see what she has to say about the importance of water. is our seminar to address industry issues in an in-depth manner. Once again we are bringing together expert panelists from within the industry to lead the one day event Friday, February 22, 2019, at The Country Inn of Berkeley Springs. Time: 1 to 5 pm. The seminar is free so we hope you will attend this exciting event sponsored by Travel Berkeley Springs. The Berkeley Springs International Water Tasting is held at The Country Inn of Berkeley Springs, in the center of downtown Berkeley Springs, West Virginia home to the historic warm mineral springs in Berkeley Springs State Park. Preliminary judging is Thursday, February 21 and the final tasting is conducted Saturday, February 23, followed by a reception announcing winners for both bottlers and municipalities. The Saturday evening tasting and reception, billed as black tie/bib overalls optional, is open to the public. The Berkeley Springs International Water Tasting has generated much interest in the water industry through feature articles on most major radio and TV networks coast to coast, and around the world. The Berkeley Springs International Water Tasting & Competition has been featured on National Public Radio, BBC, MSNBC, FOX News Network, CNN, USA Today and Beverage Industry Magazine. Rooms fill up quickly in our delightful resort town, during this major weekend of the winter season. We urge you to decide and make your reservations at the lodging place of your choice as soon as possible. For a detailed list of lodging in Berkeley Springs call Travel Berkeley Springs at 1-800-447-8797 or check us out online.